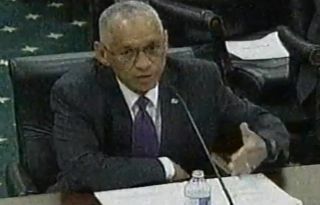 NASA chief Charles Bolden testifies before members of Congress on April 8, 2014. WASHINGTON — What in another year might have been a routine hearing about NASA’s annual budget request turned into a heated, and sometimes partisan, exchange about the agency’s internal security practices and the broad state of the U.S. human spaceflight program. In theory, the purpose of the April 8 hearing of the House Appropriations, commerce, justice, science subcommittee was to allow lawmakers charged with writing NASA’s 2015 appropriation to ask questions about the roughly $17.5 billion budget request the agency released in March. NASA, and the rest of the federal government, released its budget request March 4. Wolf said Congress probably will not produce a NASA spending bill until after August. A bipartisan budget deal struck in December that eased the effects of sequestration on NASA and other discretionary spending agencies for 2014 and 2015 makes it less likely that the House and Senate will produce irreconcilable spending bills this year. After swearing him in, Wolf pressed Bolden about a review of security at NASA field centers conducted last year by the National Academy for Public Policy after Wolf went public with whistleblower allegations of major security lapses that allowed foreign nationals access to sensitive NASA technologies. Wolf then switched the subject to NASA’s human spaceflight program, questioning the agency’s management of the Commercial Crew Program: NASA’s plan to replace the shuttle with one of three commercially designed systems by late 2017. Since 2010, “we appropriated almost $2 billion for the program, including increases every fiscal year while the [NASA] top line has simultaneously been decreased,” Wolf said. “We protected this program,” the chairman said. Bolden did not see things that way. Bolden replied that if NASA does not get its $848 million this year, the agency cannot even guarantee that one of the three competing systems now funded under the Commercial Crew Program will be ready to fly by 2017. Bolden also brushed aside an old subcommittee idea, advanced this time by Rep. Robert Aderholt (R-Ala.), of anointing a single Commercial Crewprovider so that the program’s budget could be trimmed and the balance poured into the Space Launch System (SLS) heavy-lift rocket being developed at the Marshall Space Flight Center in Huntsville, Ala., and its companion Orion crew capsule. Bolden also told Aderholt that NASA has yet to decide on a final configuration for the heaviest variant of SLS, which must, by law, be able to send 130 metric tons to low Earth orbit. The superheavy SLS will use either competitively selected advanced boosters, paired with the Boeing-designed interim cryogenic propulsion upper stage that will launch with the 70-metric-ton SLS on its 2017 maiden flight, or an advanced upper stage. Meanwhile, rising diplomatic tension with Russia about its annexation of Crimeagave Republicans and Democrats alike an opportunity to decry — and blame the opposing party for — the U.S. reliance on Russian Soyuz spacecraft to get American astronauts to the international space station. Rep. John Culberson (R-Tex. ), a skeptic of NASA’s Commercial Crew Program to replace the shuttle with one of three commercially designed systems by late 2017, lamented that the Obama Administration canceled the low Earth orbit crew rocket conceived under the Bush Administration’s Constellation Moon return program. “But for the cancellation of the Constellation program, we would be very close to returning to low Earth-orbit” using the program’s Ares 1 rocket and Orion crew capsule, Culberson said April 8. Constellation was created in response to a 2004 report, the Vision for Space Exploration, which was unveiled just one year after the loss of the Space Shuttle Columbia. That report called for retiring the shuttle fleet and leaving U.S. astronauts temporarily dependent on Russia for a ride to the space station while NASA developed a successor — as Rep. Chaka Fattah (D-Pa.), the subcommittee’s ranking Democrat, reminded his colleagues. After canceling Constellation, “the Obama administration was pushing a new thrust, which was: Let’s commercialize low Earth-orbit,” Fattah said. Bolden, as he did in a March hearing with the House Science space subcommittee, stressed that the Commercial Crew Program is the only alternative to paying Russia $70 million for each astronaut round-trip to the space station. Bolden also said NASA was further softening an already squishy ban on cooperating with Russia. On April 2, NASA announced — after an internal memo leaked to the press — that the agency was suspending most official contact with Russia, except for any that involved the space station. On April 8, Bolden told lawmakers that NASA had carved out other exceptions. NASA officials will now be allowed to attend the 40th Committee on Space Research Scientific Assembly, also known as COSPAR, in Moscow Aug. 2-10, Bolden said at the hearing. Likewise, operation of Russia’s Dynamic Albedo of Neutrons, a radiation-detection instrument mounted on the Curiosity Mars rover, was exempted from the ban on cooperation with Russia. Bolden also took a few jabs from the subcommittee about the security report completed earlier this year by the National Academy for Public Administration. Wolf said he was disappointed Bolden did not publicly release the academy’s full report, which detailed a review of foreign national access at NASA field centers, and information technology security. Culberson, the subcommittee’s senior Republican after Wolf, went a step further, accusing NASA of burying the report “because it’s embarrassing” to the agency. Bolden said the sensitive-but-unclassified report was withheld from public review because it contains descriptions of vulnerabilities in NASA’s IT and security systems. Richard Thornburgh, the former Pennsylvania governor and U.S. attorney general who led the probe into NASA’s access policies for foreign citizens, testified that while NASA’s many international activities leave it open to “insidious threats,” the probe revealed no evidence of criminal wrongdoing by the agency. Follow Dan on Twitter: @Leone_SN. This story was provided by SpaceNews, dedicated to covering all aspects of the space industry.